You can easily transfer your all Contacts into your SalesforceIQ Contact Gallery. 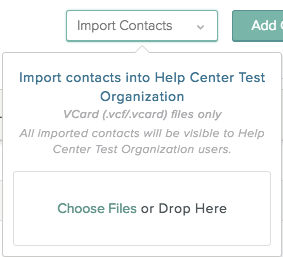 Note: Currently, SalesforceIQ supports importing Contacts in the VCard (.vcf) format only. See the sections below for information on downloading a VCard file for Gmail or LinkedIn Contacts. For other systems, look for the VCard or .vcf format in your export options. Click at the top of the screen, and then select Contacts. Drag and drop the VCard file for the Contact you want to import. Click Choose Files and search for the VCard file (.vcf) file. After your VCard file import is complete, SalesforceIQ sends you an email confirmation. Also, after you import a Contact, you can edit or update the Contact and the changes are shared across your Organization as usual. Note: If you import a Contact that is similar to an existing Contact, in most cases SalesforceIQ creates a separate Contact entry but displays a merge suggestion for the two Contacts. In some cases, when the system has a high certainty that the two Contacts are identical, it merges the imported Contact into the existing Contact record automatically. Go to your Gmail Inbox. Click Mail in the upper-left corner, and then click Contacts. 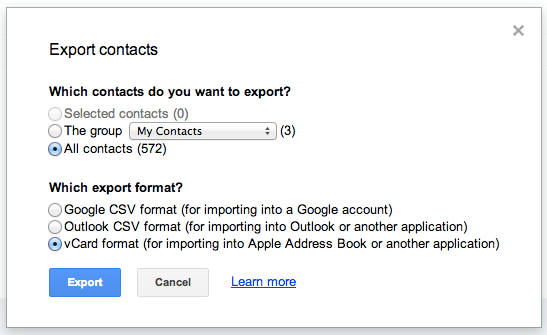 In the Contacts section, click More, and then select Export. Select which Contacts you want to export. Select the option vCard format (for importing into Apple Address Book or another application). Go to your LinkedIn home page. Click at the top of the page. In the left sidebar, click Your connections. Click Manage synced and imported contacts in the upper-right. In the right sidebar, under Advanced actions, click Export contacts. You might be prompted to sign into your account. An email is sent to the email address you have listed under Primary Email address in LinkedIn. Open the email and click the link to download your list of connections as a CSV file. You can then use an online tool to convert the CSV to a VCard for uploading to the Contact Gallery, or import the CSV file into a SalesforceIQ Contact List. Note: If you're using Internet Explorer and you see a yellow pop-up blocker across the top or bottom of the page, click the yellow bar, select Save As, and save the file to your desired location.